We’re kicking off our month of paradoxical romantic/punk fashion with inspiration from the Victorian era. And while everyone is ready to do light-colored fashion for spring, our colors will remain darker as we cover dark romantic and punk style. Due to advancements in technology and economic growth in England under the rule of Queen Victoria, fashion was able to flourish. It became easier to produce and distribute not only clothes, but magazines, which spread ideas about fashion. For women during this time, fashion was a statement of economic wealth. The more decorated and embroidered the clothing, the wealthier the woman. Corsets creating a slim waist and layered voluminous skirts were the height of fashion. 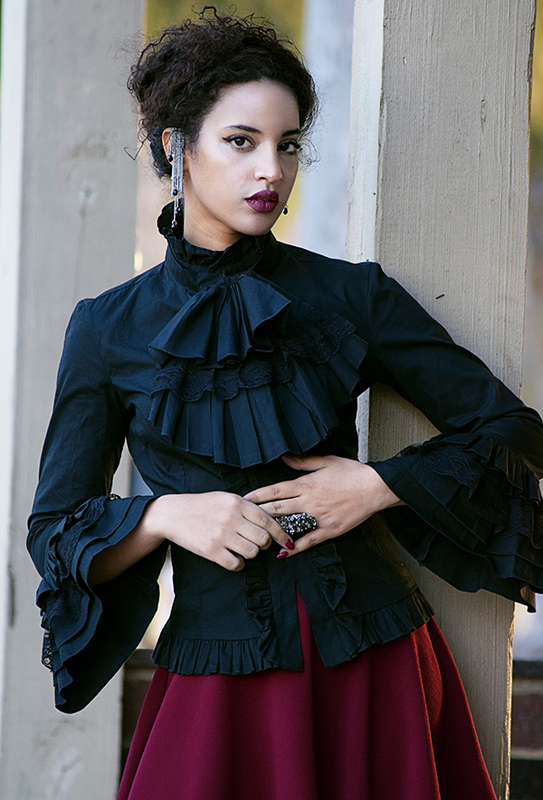 In our modern take on Victorian romance style, a multi-frilled shirt paired with a flared skirt embodies the spirit of the Victorians. Of course, the skirt length would have the Victorians blushing. While the Victorian shirt might seem over the top, it fits in well with the rise of the bell sleeve trend. Be sure to check back this Thursday, where we will feature the same shirt in the counterpart to this look, Victorian punk. With a little Photoshop Magic, we amped up the makeup for a more dramatic dark romance flare.